CRM software is one of the most effective tools you can use in your organization as it can help you nurture and enhance customer relationships. Those of you who have successfully implemented a CRM know how valuable it can be, but there are many businesses who still have yet to adopt a CRM. This could be due to cost and/ or resources or the lack of senior management buy in. We’ve talked about CRM facts previously and how it can help you get management on board. Now, we have the visuals to support them. Use these 12 CRM charts to show the true value of CRM. Investing in CRM software is a top priority for IT in 2018, as businesses focus more on customer retention and customer satisfaction. And the growth in the CRM industry shows no signs of slowing down. In 2008, CRM spend was forecast to reach $18 billion by 2016, yet a recent report by Gartner shows the growth has doubled and is now expected to reach more than $40 billion in 2018. 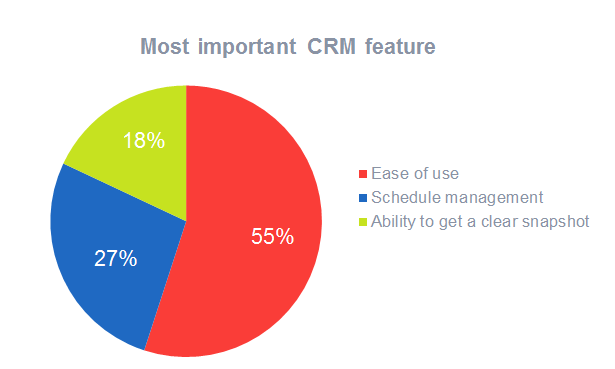 What’s the most important CRM feature? Research by Inside CRM found that 55% claim ease of use. For starters, it’s easy to get up and running with cloud based CRM. Also, choose a CRM system that is intuitive and has a user-friendly interface. For example, a CRM system that offers onscreen training, clearly labeled buttons and tool tips will help drive user adoption across your organization. Not only is the CRM industry growing at a rapid pace, but Mobile CRM is expected to grow by 500%, with more than 50% of business rolling out or piloting mobile CRM. European organizations have been slower to adopt with only with 34% having successfully implemented a mobile CRM. One of the added benefits of implementing a mobile CRM is providing sales teams with access to real time customer information while out in the field. A recent study by Nucleus Research found that mobile access to a CRM increases sales force productivity by an average of 14.6% with a further 3 in 10 mobile CRM users reporting productivity improvement by more than 20%. A A more productive sales rep means a healthier sales pipeline. Not only will a mobile CRM increase sales productivity, it’s also a significant factor to help sales reps meet their sales quotas. Companies that have mobile CRM enabled had a much higher percentage of reps achieving their sales quotes. By implementing a mobile CRM, the research has shown us that your business will see an increase in employee productivity and revenues. Tech News World surveyed more than 500 organizations and found that the benefits of CRM technology can benefit almost any business and in several different areas. In fact, it’s difficult to think of any other business-related technology that is as versatile as CRM that has as many direct benefits. While most people think of a customer database when they think customer relationship management but, CRM software is a great source for managing and nurturing prospects, identifying their needs and marketing relevant content to them all while being able to get a 360 degree view of each and every customer. Scribe Software found that 6 out of 10 SMB’s are using their CRM software for email marketing. It’s common to believe that your customers leave you because of pricing or product. That’s not true. The widely-cited study by The Rockefeller Corporation shows exactly why customers leave – 82% of customers will leave because they think you do not care about them. Customers want to be treated as individuals. That want to feel like their business matters to you and that you care. What happens when you have a bad experience? You tell someone, right? In fact, ClickFox found that 1 in 2 people will tell their family and/ or friends about a negative experience, and as high as 2 in 3 people in the UK. The study of 440 consumers also found that 35% would stop doing business with the company altogether. A survey by ClickFox found that the best way to create customer loyalty is to provide exceptional customer service 24 hours per day and 7 days per week. Another survey found that a customers’ experience impacts their willingness to be loyal advocates. If you can focus on delivering excellent service, then customers will stick by your brand. When you think of increasing customer service, you think of happier customers. But the hidden benefits of a great customer service strategy are that not only will keep more customers, but you will increase your sales too! 73% of US adults say that a friendly customer service made them fall in love with a brand, which means a customer will stay with you for longer and spend their money with you, and not your competition. Customers who receive a competent and knowledgeable service are more likely to remember their experience. We know this leads to brand loyalty and increases sales, but did you know that customers are willing to pay more for good service? A study by American Express found that customers are willing to spend up 12% more with a company that delivers an exceptional service. Smart businesses are putting the customer first. By using customer data, they are able to deliver relevant and targeted content that adds value to the customer experience. And without CRM software, you will find it difficult. As the CRM industry continues to grow, your competition is putting more focus into understanding what customer wants, and needs. Don’t get left behind. Now it’s your turn. What are your favorite CRM charts? Let me know below. To get started with CRM software, download the free CRM Buyers’ Guide below. This is all good and useful background information. 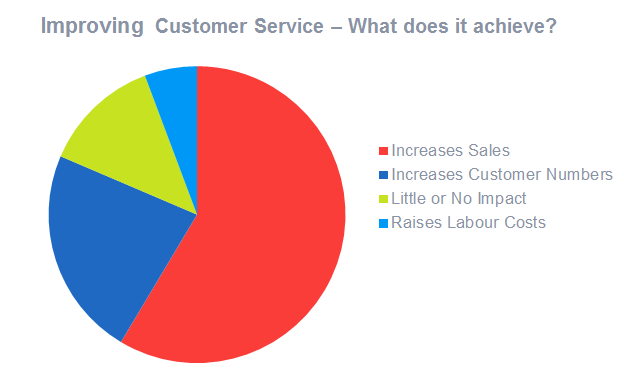 It would also be really useful to understand what the key reasons were why people bought the CRM system . Nice Article. Informative for all the business owners. It shows the CRM values in small business. Can organizational charts be drawn with SuperOffice? Otherwise, can organizational charts be easily imported to the app? That's exactly, right. They can be imported and saved in SuperOffice.